The Generate Harmony Voices dialogue box. If you're blessed with access to talented and technically knowledgeable vocalists, recording and mixing vocal harmonies can a real pleasure, but some of us don't have this luxury, and find ourselves needing to fake realistic harmony parts. 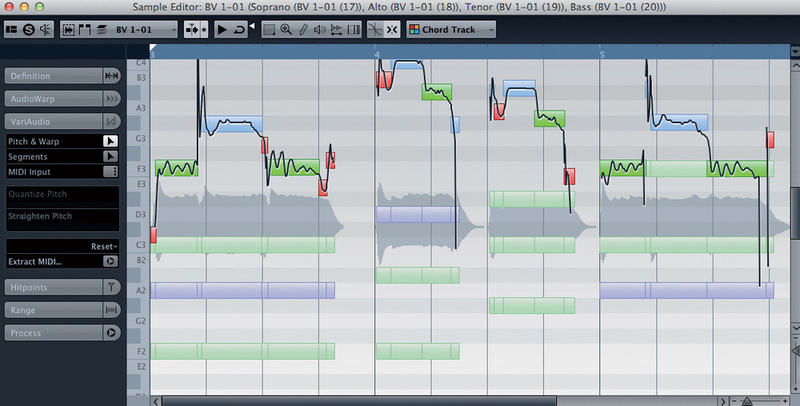 Cubase 7 has a number of tools that can be used to do this pretty convincingly. In this article, I'll work through two scenarios, each starting with a single vocal take: creating multiple harmonies for vowel-based ('ooh', 'ahh', etc) backing vocals; and creating lead-vocal harmonies that follow the actual lyrics! If you have a monophonic audio event selected, the Generate Harmony Voices option (found in the Audio menu) can be used to create up to four harmony parts from this original, each of which will be placed on a new audio track. If you've not defined a Chord Track for the project, these harmonies are created at a set number of semitone intervals from the original: the first harmony is +3 semitones; and subsequent voices are placed at -3, -6 and -9 semitones. 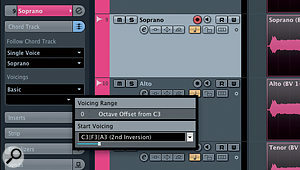 The original vocal (active) and the rather unmusical default four-part harmony generated in the absence of a Chord Track, all displayed in a single Sample Editor window. Note the drop-down menu at top-left that allows you to select which track is active for editing.In the absence of a Chord Track, although these default intervals are unlikely to result in anything that fits the harmonic structure of your song, they often serve as a useful starting point, particularly if you want to create a single harmony voice for a lead vocal. However, when you generate a four-part harmony, audio artifacts will become quickly apparent, particularly in the -6 and -9 semitone pitch-shifts. If your harmony parts are low in the mix, or you're deliberately going for a synthetic sound, this might be acceptable, but more realistic results are going to require fairly careful work. 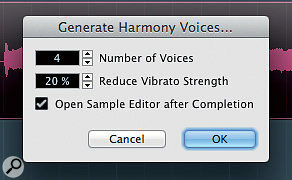 As well as choosing the number of voices to be generated, you can control the vibrato strength. Higher values apply greater pitch straightening, and for some backing-vocal styles this can be quite effective. However, once the harmony is generated, you can't restore the pitch straightening without also losing any larger-scale pitch changes — so unless you're aiming for a deliberately synthetic texture, it's best to opt for a low value and perform any further pitch straightening that's required manually, using the Sample Editor. A further option in the Generate Harmony Voices dialogue box enables you to open the harmony parts in the Sample Editor, but note that you can do this at any time by simply selecting the audio events and hitting the Enter/Return key. This allows you to see — and edit — multiple VariAudio 2.0 parts in a single instance of the Sample Editor, with one track 'active' for editing and the 'non-active' tracks appearing more faintly in the background. This is ideal for creating harmony parts. You can select which track is active for editing via the drop-down menu on the left side of the Sample Editor toolbar, or by clicking on a VariAudio segment belonging to a particular track. A three-part harmony that follows the Chord Track; more musical but still fairly static. Configuring a Chord Track prior to using the Generate Harmony Voices function should — in theory, at least — mean that somewhat more musical harmonies are created, and this is a good place to start our first worked example, with block 'oooh'-style backing vocals. Assuming you have one sung backing-vocal line, you can start by using the Generate Harmony Voices function to create four additional parts. These will automatically follow the Chord Track and, by default, you will end up with soprano, alto, tenor and bass parts (check the Inspector's Chord Track settings for each of the new tracks). The default output can be somewhat static and mechanical and, even in the context of a mix, a little further editing is generally required. When doing such editing, use the Sample Editor and engage the Chord Track display option, so that the note segments appear colour coded (green for a note within the current chord, blue for a note within the current scale and red for anything else). This colour coding is a useful visual cue when you're manually editing the harmony-part pitches: unless you are feeling particularly experimental, avoid the red and aim for green or blue! If the more extreme pitch-shifting makes some of the harmonies unusable, try resetting the pitch changes using VariAudio, and you can also try changing the Inspector's Chord Track settings to produce a second soprano or alto part, which might work better. Manually editing the VariAudio settings for this second version, perhaps adding some further pitch quantisation or applying a little audio quantisation, will help create the illusion of two different performances, even when both are 'faked' from the same original source. You can also experiment with the way each harmony part follows the Chord Track. The Inspector's Chord Track tab provides plenty of possibilities, but it's going to be a case of trial and (lots of!) error; while I suspect that there are a few folks at Steinberg who understand fully how the various options interact, I found the Operation Manual a little lacking in its coverage of this feature. The Voicings setting is a good place to start: I recommend you set it to Basic, open the Settings dialogue box, and start experimenting with the Start Voicing setting. This changes the chord inversion used for the currently selected harmony. For the soprano, alto and tenor voices (the bass voice sticks to the root note of each chord), it allows you to quickly audition different possibilities. The Voicing Range control allows you to quickly audition different harmonies when a part is following the Chord Track. Our second example is the creation of a single harmony that follows the lead vocal. The same techniques apply if you want to generate a couple of harmonies to add emphasis to selected words or phrases of the lead vocal. Generally, this requires a little more 'hands on' work than the preceding example. Let's take a typical scenario, in which we add a harmony part that's pitched a third above the main lead vocal (that is, based on the scale used for the melody, two notes above the lead vocal note). 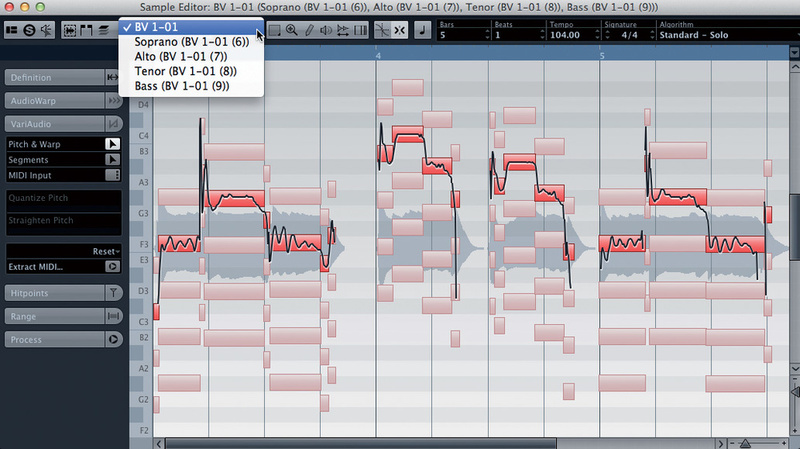 The initial harmony track can be created via the Generate Harmony Voice function, or by simply duplicating the lead part. Either way, manual editing of the harmony part's pitch segments will be required to ensure that they all lie two scale-notes above the pitch of the corresponding segment in the original vocal. 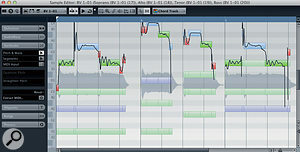 You might think it would be nice if Cubase had a 'scale snap' function, so that you could select all the notes, drag upwards from the original pitch and have them all jump to an appropriate note on the scale — but while there's a logic to the pitches required for this kind of harmony part, it's always best to let your ears be the final judge. If one or two notes simply don't sound 'right' a third above, feel free to experiment. Even working manually in this way, the process takes only a few minutes for each segment. 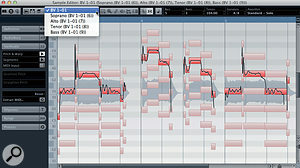 Creating a harmony lead vocal at an interval a third above the original lead vocal requires manual editing of pitch segments — and ear-based decision-making as to what interval works best for each note.If you want to add harmony parts to the occasional word or phrase of a lead vocal, rather than the whole part, make a duplicate of your lead vocal track and manually edit it to isolate just the words or phrases that you want to harmonise. This allows you to make sure the editing of the starts and ends of each word are as clean as possible. Once this is done, select all these separate audio events and use the Bounce Selection function (in the Audio menu) to recombine them into a single audio event. You can then apply the Generate Harmony Voices function to just the required phrases and follow up with any manual pitch editing. as for our 'third above' example. 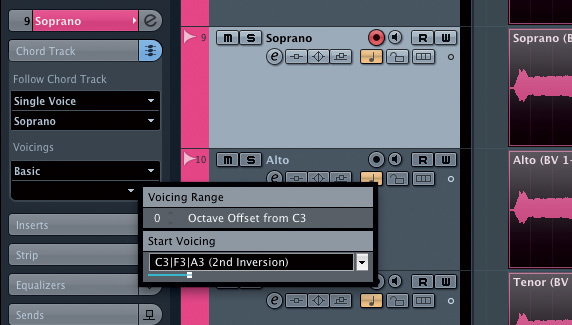 Once you're happy with your harmonies, whether backing vocals or lead harmonies, it can be useful to apply the Flatten function (in the Process section of the Sample Editor) to each track, just to lock the VariAudio changes in place. Mix the 'fake' parts a few dB beneath the original vocals, apply a little panning, and the job is done. If you just want harmonies for certain words, edit a copy of your original to isolate just those words prior to generating the harmony parts. The technology behind the Generate Harmony Voice function, VariAudio and the Chord Track is very clever, but it's not without limitations. The human voice reveals the artifacts of pitch shifting like no other sound can, and the harder you push the technology in your quest to create the perfect fake harmony, the more obvious the 'fake' becomes. Equally, while one or two auto-generated voices can often be made to sound very effective, their artificial nature becomes more obvious as you add more voices that have been generated from a single source. If you limit yourself to one or two voices with pitch-shifting of a few semitones, though, you can create something quite convincing, particularly if you're willing to perform a little manual editing on the result. That said, in some musical styles, the rather synthetic nature of extreme pitch-shifting is not a problem — indeed, it is an intentional part of the sound — in which case, feel free to push the VariAudio envelope as far as you like! The author has provided a couple of audio files to accompany the worked examples in this article. You can find them, along with a detailed description, on the SOS web site.